Create a safe, hygienic and comfortable play area for your little explorer with a unique baby play mat. 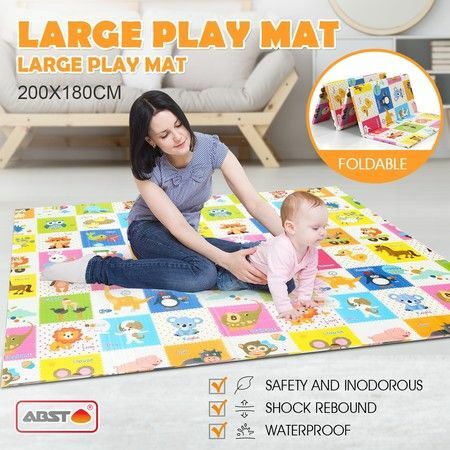 Crafted with anti-slip fabric, this soft and smooth baby mat is perfect for kids' crawling, rolling, and tumbling, while protects against the cold hard floor. The waterproof and crease-resistant surface also makes it easy to stay look new and wipe away the drool and spit-up. Covered with letter and animal pictures, this colorful baby floor mat allows parents to educate their little ones as they're playing. The included foldable storage bag provides more convenience for taking the padded play mat for a picnic, camping or other family trips. Don't hesitate to bring one baby activity mat home and let it help build a more intimate relationship between you and your little ones! I use this play mat for underneath a large play pen which sits on tiles. Itrsquos excellent I just bought another one. I no longer have to worry about bub hurting himself if he falls. Itrsquos a great price too in comparison to other play mats. Item as described. Very Happy with product. Very Good seller.